Over the past few weeks I’ve spent time with people who’ve wanted to learn more about ASD. It’s been interesting hearing what their perceptions about it has been and where they learn their perceptions from. After finding out how they base all their knowledge on films such as “Rain Man” and “Mercury Rising” and the such likes, I begin to tell them about Theo’s daily routines and how life is for him. I try to express as strongly as possible that “When you’ve met one person with Autism, You’ve met ONE person with Autism”. I could talk forever and a day about Theo, about how life is different for his siblings and our family. I could talk forever and a day about how if his routine is messed up it can take from hours to days to try and settle him back into his normality depending on how upset and anxious this change has made him. I could talk about how moving from Dumfries to Washington has made such a dramatic impact on his development that the things I was told he’d “never achieve” have been accomplished and how he’s surpassed his believers expectations never mind the disbelievers. I always come back to the same line however “When you’ve met Theo, You’ve only met Theo”. It doesn’t matter if you know a million and one children with ASD, you still know another million and one more that have ASD affect their lives in different ways to the first lot! I absolutely encourage you to help your knowledge of Autism grow and develop by looking at the page!! Natural feelings and thoughts that can go through a carers head. These thoughts are what can come from being a completely selfless human being, giving care to a friend or a loved one who is dependant on you and has entrusted you to serve their care duties. If there is one care giver in this world that states that they haven’t had at least one of these thoughts pop into their heads, I’d be the first person to stand there and tell them that they’re lying. I myself have felt low, jealous, constantly tired, so on and so forth because I overworked myself and didn’t give myself the chance to have a little bit of “Me Time”. It wasn’t until I got with Stuart after having years of very limited support with Theo, I realised that I didn’t have to do everything myself, if I was feeling low he’d take Theo out and give me the chance to catch up on some sleep or have a shower or do the dishes or just do something where I didn’t have to be 100% alert as to what he was doing. I felt guilty as sin that he was doing it and I had no option but to accept the fact that he was doing it because it was his way or no way. Once I’d gotten over the whole self indulged guilt trip and realised that he was doing a fantastic thing and improving my care for Theo I finally accepted things as they were. That little bit of time that he was giving me for what ever reason absolutely improved my relationship with Theo, it improved his bond with Theo (to the point where he now classes him as Dad), it also gave him the chance to help Ali, Theo and Alex a better relationship as they all seen that the way forwards was a family unit, not Mummy doing it all. All round that man has worked wonders for our little family. However … back to my point … Are you a caregiver that’s felt any of those feelings or had any of those thoughts? Are you a friend of a caregiver (no matter what the situation is) that has noticed changes that could be fitted around any of those thoughts or feelings in their friend? Make a difference for yourself and the fantastic work that you do … Have a little bit of “You Time!”. Before your time of being a care giver, did you have a hobby you used to take part in that you gave up? Did you have friends that you never get the time to speak too face to face any more? Did you meditate? Did you go swimming? Did you do anything that you’re now always thinking that you’d love just half an hour to yourself to do? Is there something new you’d like to be able to try? Do you want to learn how to knit, embroider, cross stitch, play a musical instrument, is there a cupboard that needs cleaned out that would give you so much pleasure out of finally getting it done? … you probably get the point by now … But this is your chance to grasp it! If you are lucky enough to have someone that the person you care for and yourself trusts to take over the duties for half an hour, an hour, two hours … probably pushing it but … over night?! Ask them! They’ve probably been sitting on the edge of their seats wanting to offer to help out however not wanted to offend you or diminish the fantastic job that you’ve been doing so thought it best to wait until you asked them. (Or if you are that person that would love the opportunity speak to the Angel and offer!). Lets face it, the worst that can happen is be told “No” … You’ll have been told worse in your life at one point or another! If you haven’t got anyone that you can turn too, when the person you’re caring for is in bed at night, out at a meeting/school/playgroup or so on n so forth, Grant yourself a little piece of that time to indulge yourself in something for you! All the other jobs and tasks and routines can be arranged around it, just give yourself that time!! Start with half an hour through out a week, even if it’s 5 mins one day, 10 another etc. Just give yourself that time to get your mind away from the thoughts above and 100% back onto the job. Think of it along the lines of … You’re not being selfish because you’re doing something for yourself … You are improving the perfection on the care because you have done something for yourself! A little something I found via a group on Facebook I simply had to share! Congratulations! You’ve been awarded a new title. You’re super qualified. I know, you’re just a parent. You’re not an SLP, an OT, a PT, or an MD, a Psych or a BCBA. You’re the person who got up at 4 am because your child only needed 3 hours of sleep last night. You smiled as you watched him play out his favorite movie script, word for word. You felt despair as you did everything in your power to convince him to put down his Game Boy and get ready for school. You revelled in his endless delight with the soap bubbles when he washed his face. You thought you were going to tear out your hair as you reminded him 40 times to put on his shirt. You happily made his regular breakfast and cut his waffles into perfect squares with one dot of syrup in the middle, just the way he likes it. You rejoiced when you watched him and his brother playing and laughing together. You felt like you were on the verge of insanity when you listened yet again to the baseball statistics and answered the same question 23 times in a row. You laughed heartily when he told you the weather was going to be poor and he was excited to see lots of Nimbostratus clouds and very few cirrus clouds. You felt frustration and admiration when you asked him where his lunch bag was and he replied by naming 30 carnivorous dinosaurs, in size order and explained which period they lived in. You felt pride when you watched him independently organize his school bag and gather his belongings. You patiently waited 8 minutes for him to tie his shoelaces even though you grew increasingly anxious about the time passing by. Your heart sang when he looked up at you as he was done, so proud of himself that he had done it alone. Your eyes brimmed with tears when just before he stepped on the school bus, he turned back and without a word and without any eye contact, he gave you a big hug, letting you know in his own special way how much he loves and appreciates you for everything that you do. This is the profile of an Absolutely Exceptional Parent. (AEP) So from now when you sign your name, make sure to include your new title…AEP. I have to say the feedback that I’ve received has been amazing from the couple of blogs that I’ve done so far on Autism. It’s really surprised me the fact that so many people have been retweeting my blog and giving me such great comments back!! Over the past few days I’ve found that there is still far too many parents and carers that have ASD as part of their daily lives still feeling as if they’ve isolated and alone, not knowing which way to turn for support and advice no matter if it’s pre or post diagnosis. Tonight there was one thing that I realised after speaking to a number of folk – On the off chance that they happen to fall across my blog – I may be able to make a difference!! One of the best places to turn to for to get this support and information is at your fingertips right now! There are many fantastic online communities, dedicated sites, users of social communication sites that are here to help, advise and most of all support you. The best thing about it is – you can sit comfortably at home after a really stressful day and not worry about people seeing you! To the people who are already regular readers of my blog and ASD connected – If you’d like to share anything please feel free, let me know if you don’t mind me reblogging your posts or sharing a community you’re involved with – at the end of the day, as you’ll know your self we’re forever picking up useful bits and bobs that are worth while trying just through speaking to other parents and carers. If you happen to have just stumbled across my blog and have experiences to share, sites or online communities or information pages please do post up and get involved. I’d love people to be posting up more to share with people who are new and unsure of ASD. Now for the folks that really matter, if you’re new to ASD, unsure of where to go and what to do, needing to ask questions about anything – REMEMBER there’s no such thing as a silly question! If you’re just needing to share your experience and seek advice or hints and tips to try – You’re more than welcome to post up on here and I’ll do my best to get you an answer. 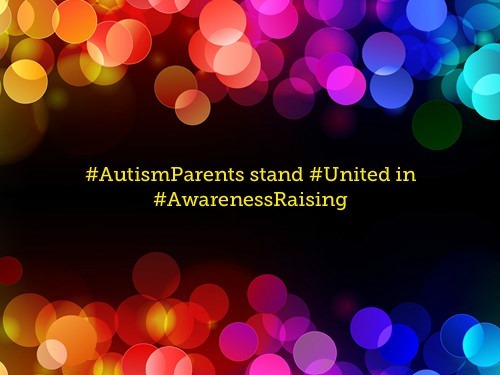 Autism Parents Stand United In Autism Awareness!